THE Ladbrokes Championship season is only two games old and already Livingston, who spent much of last term scrapping for their lives, find themselves in the relegation zone, still searching for their first point. The Lions had started their campaign with a dismal 3-0 defeat at Raith Rovers, and they were unable to find a way of boosting the 600 home supporters who turned up at Almondvale on Saturday as Queen of the South edged an underwhelming match courtesy of a second-half goal from Lewis Kidd. The West Lothian side carried little threat in the final third, with Queens goalkeeper Robbie Thomson a virtual spectator, while Livi’s Liam Buchanan was completely isolated as the lone striker as Mark Burchill tinkered with his starting XI. “We never performed to anywhere near the levels I think we can,” said the Lions manager. “We didn’t test their goalkeeper enough and didn’t work their defence enough. That isn’t criticism aimed towards Liam Buchanan as he was up there himself a lot of the time. We tried to keep the ball at times when it wasn’t really on and should have gone forward that wee bit quicker. Both side’s pre-match preparations were far from ideal, with the match delayed by 15 minutes due to one of referee George Salmond’s assistants being held up in traffic. When the game did get under way, Queens had the first effort after a weak challenge from Hippolyte just outside the area allowed Ryan Conroy to break free and feed Derek Lyle. However, the veteran’s curling shot, which appeared to be bending into the far corner, was tipped round the post by Livingston goalkeeper Darren Jamieson. The hosts were struggling to contain their quick-thinking opponents and, from Mark Millar’s delivery, Lyle again squandered a great opportunity in front of goal as he headed wide from eight yards out. Scott Pittman was trying to make things happen in the Livingston engine room, but any threat was nullified by former Lions team-mate Kyle Jacobs and Millar as Queens continued to dominate possession. Another former Livingston favourite, Iain Russell, should have scored for the vistiors, but he flashed his shot across goal. Livingston won a series of corners in the closing minutes of the first half but James Fowler’s side were well organised and dealt with the set plays. Early in the second half, Buchanan broke free into the penalty area and his cutback was just missed by the outstretched Danny Mullen, who was inches away from giving the home side a surprise lead. 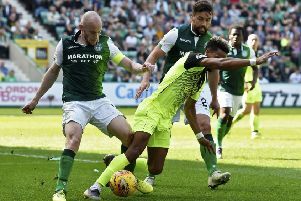 Kidd was booked – and perhaps fortunate to avoid a red card – for a rash challenge on Hippolyte that left the Londoner writhing around the turf in severe discomfort. The fact the full-back remained on the park would prove pivotal to the outcome of the match, as he popped up to score the only goal of the game. With 65 minutes on the clock, the ball broke kindly to Kidd on the edge of the area and his shot managed to find a gap through a congested penalty box and ended up in the far corner of the net. Livingston introduced substitutes Jordan White and Spas Georgiev to try and find a way back into the game but it was Queens who came closest when Conroy’s free-kick struck the inside of Jamieson’s left-hand post. Livingston have an early chance to exact revenge on the Doonhamers when the two teams reconvene at Palmerston in the second round of the Petrofac Training Cup tomorrow night. “We’ll go down there looking to rectify the performance and definitely the result,” said Burchill. Livingston: Jamieson, Millen (Sheerin 86), Cole, Sives, Gallagher, Pittman, Gibbons (Georgiev 68), Glen, Hippolyte, Mullen (White 68), Buchanan. Subs: Gould, Neill, Currie, Duckrell. Queen of the South: Thomson, Kidd, Dowie, Higgins, Marshall, Millar, Lyle (Hutton 78), Jacobs, Conroy, Russell (Brownlie 86), Hilson (Smith 80). Subs: Atkinson, Pickard, Hooper, Heffernan.